Lake Mead outside Las Vegas, Nev. serves as the Colorado River's largest reservoir and a key water source for Arizona, California, Nevada and Mexico. 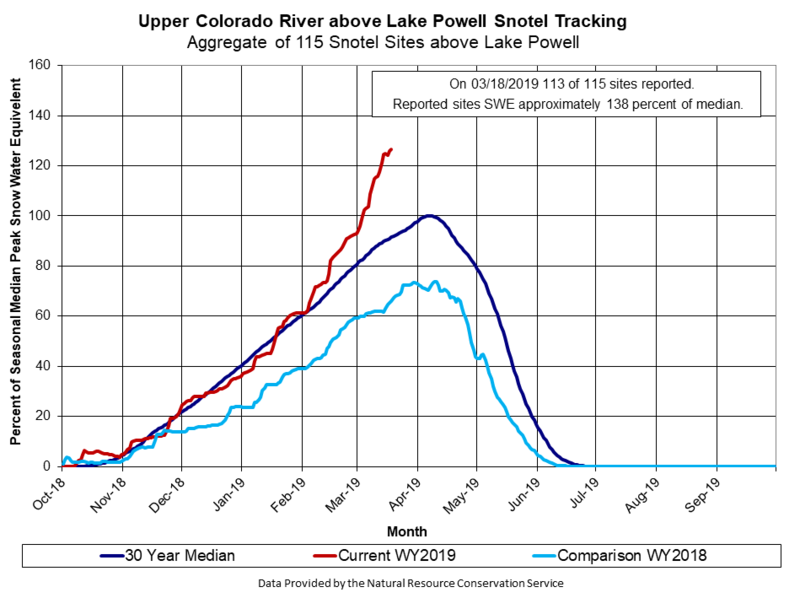 Upper Colorado River Basin snowpack is currently at 138 percent of the long term median. But federal officials are quick to remind that one wet winter won't solve the Southwest's structural water problems. "These developments may lessen the chance of shortage in 2020," said Reclamation Lower Colorado Regional Director Terry Fulp in an emailed statement. "However, one near- or even above-average year will not end the ongoing extended drought experienced in the Colorado River Basin and does not substantially reduce the risks facing the basin." A shortage declaration is tied to the level of Lake Mead, the nation's largest reservoir, and a key water source for California, Arizona, Nevada and Mexico. If it drops to an elevation of 1,075 feet at the beginning of a calendar year, the federal government can declare a shortage, forcing some users, mostly in Arizona and Nevada, to cut back. In the latest Bureau of Reclamation model Lake Mead's elevation is projected to be at 1,080 feet in elevation at the end of 2019.